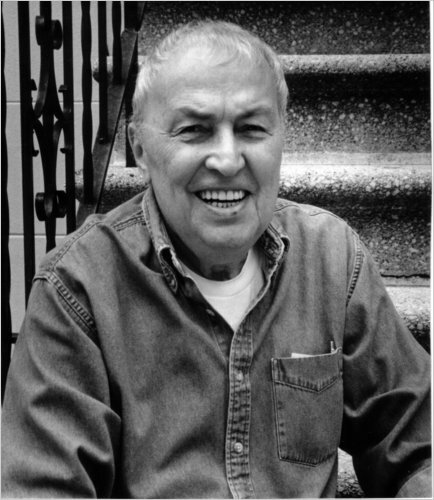 David Markson is the author of several books including Going Down, Springer's Progress, Wittgenstein's Mistress, and Reader's Block. He was on friendly terms with Dylan Thomas, Malcolm Lowry, and William Gaddis. He died in June 2010. Alexander Laurence: You have been called "the most literary man." You discovered Lowry and Gaddis. You are one of the most well-read people. When does your love for literature end? David Markson: Something that I wouldn't have believe when I was in my forties: I don't read fiction anymore. I read, but fewer and fewer novels. The only novels I have read this year have been Infinite Jest by David Foster Wallace, twice, and this summer, don't ask me why, I reread Ulysses twice. But I haven't read another novel in a year. I used to read every novel. If you look at the shelf over there you can see all the books by Faulkner. Faulkner wrote twenty novels. I must have read those twenty novels seventy times. I have fallen so many years behind. Oddly I did reread Robinson Crusoe. Don't ask me why. I skipped the beginning. AL: The disinterest in fiction has happened for the past five years? DM: It was gradual. It shows in my work. My own work is less and less like fiction in a sense. Wittgenstein's Mistress is a monologue, and the new book is not even a monologue. It's a semi-non-fiction, semi-fiction. I read a lot of non-fiction. I have read a lot of poetry. But I don't read fiction anymore because it bores me. It that line in Paul Valery that's quoted in Reader's Block: "He couldn't write a novel because he couldn't put down 'The Marquis went out at five.'" The minute I read "Joe went walked across the street to say hello to Charlie" I'm bored. Books that I loved, I can't get into again. Sometimes it's 30 or 40 years later. So I said let me see with Ulysses, it's about time. Then I read it once and cursed about how much I didn't get, or didn't understand, and had to look up words, and then I read it a second time and felt I had mastered it. I was exchanging letters with Gilbert Sorrentino and we were asking each other "I wonder what Joyce meant by this" or "I can't solve this." I have a shelf and a half of Joyce scholarship, and I read most of it over the years, and the stuff that Sorrentino and I were asking each other weren't solved there either. I have to say that Ulysses holds up: it's a great book. Joyce does everything. I love the complexities. I don't want to make a bad joke but anyone can write Crime and Punishment. People still do, and good ones, but I don't know why. It's been done. That's why, in my very small way, I'm doing what I do, these experimental books. With Wittgenstein's Mistress, I was trying, I supposed some people say I did, to maintain a character's voice. David Wallace said that "It defies you not to cry" which thrills me. This new book, I do not know how people are going to react. At the end it's very layered. The character that Reader creates suddenly bifurcates into the one on the beach and the one in the cemetery. He has nothing left but suicide. Kurt Vonnegut read galleys of the book and wrote to me: "David, I'm worried about your mental state." AL: Do you admire Ulysses and Modernists in general because of their allusions? I feel that many of them were trying to have literary traditions in their books. DM: That I love. Obviously. The books that I care about like Joyce, and Malcolm Lowry's Under The Volcano, which I wrote about in great length about four years after it came out. I wrote my master's thesis on Lowry where I wrote about all those allusions before anyone else. Nobody had written anything. I wrote about William Gaddis' first book The Recognitions. I'm mentioned as one of the earliest people to have written about it. It's a great book. Much of the Lowry criticism mentions my book. I went to a Lowry conference nine years ago. They were pleased to see me because I was able to inform them about what Lowry was like in person. I visited Lowry in Canada in 1952, and he stayed with him in New York a few years later. AL: You didn't like Gaddis' books since. What is your objection to Gaddis' later work? DM: There's a lot of satirical things that weren't that funny, but they would have been if he handled them in the same way that he did in The Recognitions. In the few interview's I've seen with Gaddis he insists upon authorial absence. The point is the author isn't absent in this business of using dialogue only. Using it as it's supposed to occur with all the repetitions and interruptions. He makes himself more evident. I can see the gimmick, the device at work all the time. The transitions I find weighty and dead. He has to get to one dialogue to another. His new book has the problem of the subject matter being so uninteresting. I hate to put down my betters, I would have given my right arm to have written The Recognitions, but I would have been happy not to have written A Frolic of His Own. AL: It seems like that you were attuned with novels around the middle of the century, but your interest has declined since? DM: Ezra Pound said that no critic wrote anything major on a writer younger than him. I suspect that it's because you don't read those writers who follow with the same sense of discovery that you have as a young man. You read your peers and the generation before. When I was a boy Joyce was a titan. That has never receded for me although I have moved on fifty years from then. It shocks me to say that I know that great works have been written on the level of Under The Volcano or The Recognitions but I can't see them. AL: Springer's Progress takes place in a bar in Greenwich Village, The Lion's Head. Could you talk more about this place and why you wrote about it? DM: There was a review in the New York Times by a guy I didn't know who mentioned The Lion's Head. But I never named it in the book, though I named some of the people. Now it's the only straight bar on Christopher Street. It's not what it used to be which was a writer's hangout. A lot of journalists and Irish singers. Fred Exley used to hang out there when he lived in New York. I still go there but fewer and fewer people from the old days still come in. Really important people used to be there. Not just saloon drunks but people like Pete Hamill, the staff of The Village Voice, The Post, and The Times. It's been there since 1968, but I suspect that it may soon go under. AL: Around 1960 you worked as an editor, wrote a few detective novels, and then finally started writing Going Down. How did you get from the pulp writing to the more serious works? DM: I worked as an editor but I didn't feel like working a regular job so I wrote a few private eye things. They wanted me to do a whole series but I didn't want to get stuck. I quit that too. I started writing Going Down when I was in Mexico. When I was there I got a fellowship. I submitted part of that book and got a grant. In those days, two thousand dollars was a lot. We lived well in the Mexican economy at that time. I was intermittently working on Going Down. I tried to make some money writing a straight western. I asked an editor friend how can I make a buck? He said if you write a decent western I'll buy it. So I wrote three pages, and called him and said that I'm not writing it because I realized I couldn't write it because I was putting in too many jokes. Turning it upside down. It became this book The Ballad of Dingus Magee. It got rave reviews. Intially it got several rejections because nobody heard of a satirical western. I sold it to MGM for a lot of money, the only time I've made money in my life. Unfortunately it was the lousiest movie ever made. The hero is nineteen, and Frank Sinatra who was 58 did a walk through playing the lead. Joseph Heller wrote the original script but they threw it out. It was an awful movie, and it kills the book. Not that the book is a serious book, but it's a pleasant book. The movie is so bad, that even people who should know better think how can the book be any good? They might re-release the book next year. After that I finally finished writing Going Down and it came out in 1970. AL: Going Down is a very different novel than the rest of your work. Did it get much attention? DM: It got some nice reviews but it didn't sell. It might be a little bit derivative. It's a book where you know the author did read Faulkner and Doestoevky. It's traditional in that sense. It's structure is twisted around and involuted. No more so than a lot of Faulkner. It's the only book that I go back and reread. Somehow I stopped thinking in those terms and going in that direction. I'm not prolific. There's always these big gaps. AL: What about Reader's Block? DM: I had all these bits of cultural and literary history, and all these quotes, which I have in the previous books. I sat here for a couple months just writing notes. I would wonder what crazy piece of information do I know about Freud? I had about three feet of file cards in no order. Then I started typing them down. I had to think about the context. Being alone is obviously crucial for me. The first draft, which is always the case with me, was a lot bigger. Although all this cultural bricolage is interesting, I didn't use stuff that I had used before. It's interesting. Things I know, or things that went through Springer's mind or Kate's mind, some of those things might repeat. I decided not to used them. It says in this book as a little game with itself: Reader is not going to use any of the references, then I deliberately use one four lines later just to be contrary in fact. Then there were a few facts I had to use since I had all these references to suicide. I didn't want to leave out all important suicides. Other than that I didn't repeat. Nobody would have known unless they read all of them in a month's time. It's a book about a guy who is having trouble writing a book because there's all this intellectual clutter gets in the way. I guess that's me in a sense. I was bored with these conflicts between characters, domestic situations, lovers, man searching for God. I have characters sitting alone in a bedroom with a head full of everything he's ever read. AL: With Going Down and Springer's Progress you were considered a regular novelist but with the last two books you turned into an experimental novelist. Could you comment on that? DM: Yeah. I could look back and see how it happened. The guy who wrote that review of Reader's Block could also sense that there were hints of what was to follow in Springer's Progress. When I was writing part two of Wittgenstein's Mistress and thought now I got it. I got a book interesting here. I threw out the straighforward novelistic part one. Like I said before I didn't want to write "The Marquis went out at five." As also I don't want to read it anymore.